Built as part of a row of seven farmworker’s dwellings, this mid-17th-century cottage hadn’t been lived in since the 1980s, and the main section had almost completely collapsed, but luckily it has been sympathetically revived by a dedicated period property enthusiasts. Let the Mackay's loving restoration inspire your own period home renovation or be inspired by our many more real home transformations. Read our guide on renovating a house, too, for more guidance. Owner: Neil Mckay, an architect, and his fiancée Helen Davison, a graphic designer, live here. Property: A part-thatched cottage, built in the mid-17th century. With a kitchen, central dining room and living room on the ground floor, an original bedroom is reached by a cupboard staircase, while a new staircase gives access to two further bedrooms and a bathroom. There is also a wet room on the ground floor. Next to the duck pond, at the heart of a sleepy Oxfordshire village, sits Neil and Helen’s part-thatched cottage, which appears as though time has stood still. In fact, quite the opposite is true as nothing much has stood still here, least of all Neil, whose single-handed renovation of this mid-17th-century home has kept him busy part time for 10 years. What Neil saw in the cottage went far beyond that crumbling shell. An architect by trade, he traced the marks that history had left on the building, gradually piecing together its story from the architectural clues. The front door to the cottage was a salvage yard find, framed by typical cottage garden planting. The front door leads straight into the dining room. With its Victorian range lit, it’s a cosy room on winter evenings. Salvaged beams give character to this rebuilt section of the property. He also discovered that the central part of the cottage had been substantially rebuilt in the mid-18th century. ‘Part of the adjoining cottage had been used to enlarge this kitchen, which would explain why there’s another fireplace there. So we’ve worked with the floor plan as it was remodelled, and whereas the living room and bedroom above it were more of a careful restoration, this side of the cottage has been a reconstruction to the 18th-century plan,’ says Neil. A homely display of old enamel coffee pots and accessories on the restored and fully functional range set the scene in the dining room. Neil had a vision for the house that now, 11 years later, he considers truly realised. He rebuilt the main section using a reclaimed oak frame put together by the builders, with a skin of Cotswold rubble stone and lime mortar on top, infilled with Hemcrete – an eco-wonder material made from hemp and lime. Neil built the kitchen cupboards and the door was a salvage find, along with the characterful shelves and table. The elm worktops and shutters were created from trees that perished in the UK’s famous 1987 storms. Vintage Woods ware supplied by The Fourteas tearoom in Stratford-upon-Avon. The builders did the groundworks and got the basic shell of the building up, then Neil called on specialists for the windows, and tiled and thatched roofs, finishing everything else himself using mainly reclaimed materials. Double stable doors open onto the back garden and bring extra light into the kitchen. Antique filing drawers provide a useful extra worksurface under the pretty wall-mounted shelving, found on Ebay. Other discoveries in the thatched section included the lino floor upstairs, which can be dated exactly, as beneath it are newspapers from the week of the Queen’s coronation in 1953. Behind a 1970s fireplace in the living room below, Neil and Helen were delighted to find a bread oven, now restored to working order, and a salt shelf. The joinery and distinctive door latch at the foot of the stairs were further evidence that, apart from the fireplace and lino, the last time any serious work was done on the cottage was around 1790. Mid-century modern meets 17th-century simple in the living room, with Ercol sofas and flagstone floors, lifted to fit underfloor heating, and lime plastered and limewashed walls. Homemade linseed oil tempera was used for the door. The patterned cushions and wool rug are by Vanessa Arbuthnott. 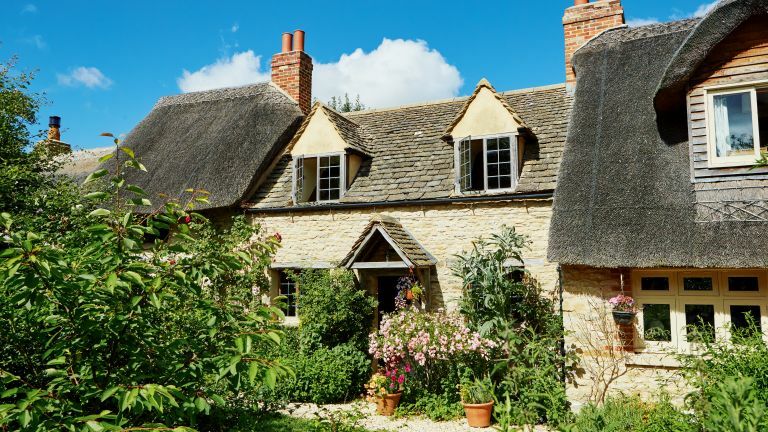 At the heart was Neil’s determination to keep a clear distinction between the rebuilt central section, and the renovated part of the cottage, the most obvious difference being in the roofing materials – Cotswold stone tiles for the rebuilt section, thatch in the other. This humble cottage may well have had oil cloths at its windows, rather than glass. Here, a collection of miniature oil lamps catches the light. In the original beam above the inglenook, it’s just possible to make out what are believed to be witch marks – thought to prevent demons from coming down the chimney. Once the fabric of the building was intact, Neil turned his attention to the finishing touches. Reclaimed flagstones, salvaged doors, a kitchen pieced together with a selection of auction finds, and shutters and worksurfaces made from reclaimed elm all find new life in the cottage against a backdrop of authentic lime plaster and paints. The cottage’s interior and exterior woodwork is painted in Neil’s home-mixed linseed oil tempera. From the impressive environmental performance, with its ground-source heat pump and underfloor heating, for which Neil lifted and relaid the flagstones, to the Hemcrete insulation and rebuilt central section, there have been surprises at every stage. ‘The fact that people come to the property and can’t initially tell that this part is reconstructed is frustrating in some senses, but also an immense compliment,’ says Neil. ‘The difficulty with conservation work is that if you do it right, most of the time you can’t see that anything’s been done.’ But the hours of research, reconstruction of period details and patient repair of salvaged finds that define this project would say otherwise.